In Arabic, the word rawiya means “she who tells a story.” Each artist in in NMWA’s summer exhibition She Who Tells a Story: Women Photographers from Iran and the Arab World offers a vision of the world she has witnessed. Shadi Ghadirian, one of Iran’s leading contemporary photographers, addresses controversial issues concerning Iranian women of her generation. Ghadirian was among the first to graduate from Tehran’s Azad University with a BA in photography. Her works explore female identity, censorship, and gender roles. Because Ghadirian works, lives, and exhibits in Iran, she tackles controversial issues through creative means. She cannot photograph a women’s hair or any physical contact between men and women. Instead she uses humor and parody to investigate the paradoxes of Iranian women’s lives and the tensions between tradition and modernity. She Who Tells a Story includes eight photographs from Ghadirian’s “Qajar” (1998–99) series and five images from “Nil, Nil” (2008). While working at Tehran’s National Museum of Photography, Ghadirian archived photographs from the Qajar dynasty (1786–1925). 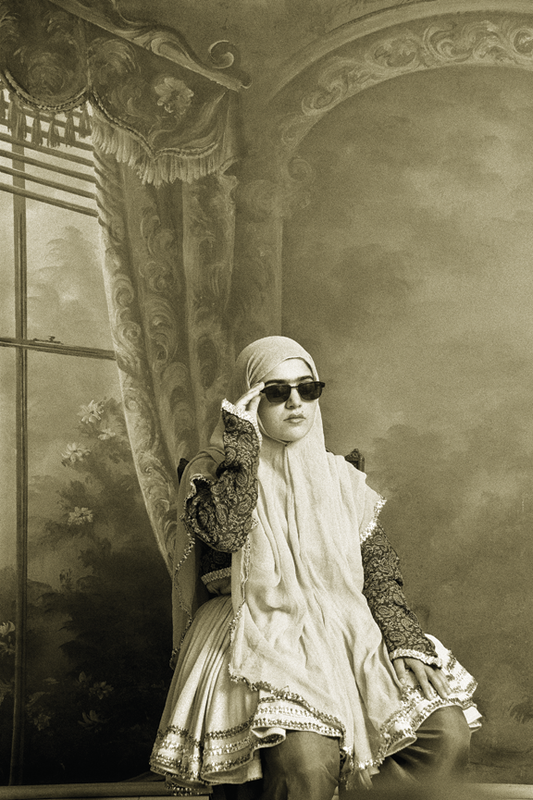 Inspired by this rich period of Persian culture, she decided to re-create the style of 19th-century portraits for her thesis, which evolved into a series of 33 photographs. 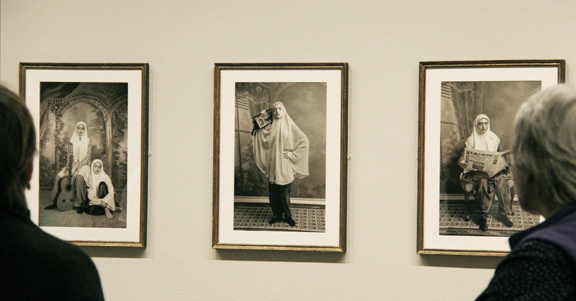 Instead of using professional models, Ghadirian had her family and friends pose in vintage Iranian costumes. Set against luxurious 19th-century backdrops and photographed in sepia, her subjects seem stately—with the exception of anachronistic paraphernalia. Each photograph includes a subversive, often Western prop, like Pepsi cans, sunglasses, boom boxes, or banned reading material. Ghadirian’s pastiches juxtapose tradition and modernity and suggest tensions between restriction and freedom.